A System Administrator is a powerful user since they have links and access to all user roles. Only a system administrator can delete the user account of another system administrator. This article explains the steps in deleting a system administrator account. Note: This step is irreversible and the user will lose all access to their data once done. Applies to all School Loop Versions. System Administrator Access is required. From the portal homepage, go to User Management > System Admins > System Admins. Ensure that the system administrator does not have any published sites. Skip this step if you are certain that they do not have any sites published. 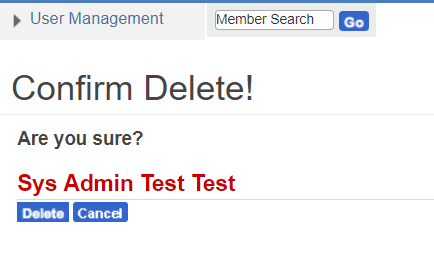 Click on the administrator user you need to delete. Click Auto Login and go to Site Center > Tools. Click the Unpublish Site button. Click Unpublish once again on the confirmation message that pops up. The button will turn into Publish once the site is unpublished. Go back to the System Admins list under User Management. Click the Delete button beside the name of the user account you need to delete. The next page asks you to confirm this action. Click on Delete again. The user is removed from the System Admin List under User Management.